Another interview with Roger Glover in the German press — this time it is from Kulturnews magazine, April 2017 issue, pages 12-13. We think that it is interesting enough that it deserves the effort of offering it to you in reverse translation (usual caveats apply). SR: Mr. Glover, the question may sound hackneyed, but: Did you enjoy making the album? 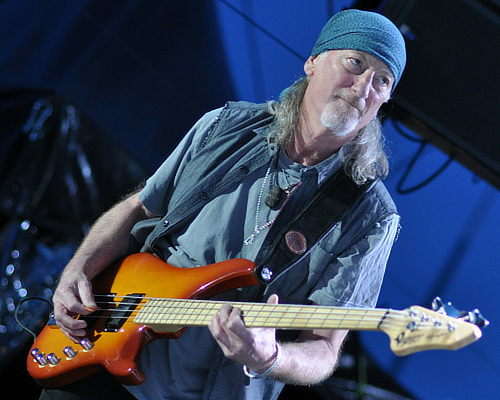 Roger Glover: The question is not at all trite, but is very justified. Fun, joy and pleasure are the key concepts for us all. We have fun in everything we do. We love to play live, we like to travel around the world, we had a great time in the studio. Without fun we would be in a wrong job and should rather leave it. We are old enough — we should not worry about the negative aspects anymore. SR: Has fun always been the focus of Deep Purple? Glover: In our long and, indeed, changing history, there were also phases in which the good mood was in short supply. Nevertheless, we continued, for somehow it seemed to us our duty is that we should hang on and go with it. Today we make music because we want it, and for no other reason. SR: Is being a rock musician the best job there is? Glover (smiles deliberately): Can you think of a better one? I’ll tell you a story. I’ve lived in America for a long time, and for a while I had two neighbours, with whom I’ve often met for a well-groomed get-together. One was a former tennis player, the other a successful banker on Wall Street. One evening we were sitting at the bar, thinking about who of us had the coolest job. The tennis star said his career was over at 35, the Wall Street guy did not find it very inspiring to simply raise money because that has basically no value. So they both pointed at me. I could not disagree. SR: Who was the former tennis player? Glover: Mats Wilander. We are still good friends to this day. SR: They celebrate 50 years of Deep Purple in 2018. What do you think about this? Glover: Bouquets? (Laughs) It’s a madness to play in a band like Deep Purple that has been around for almost fifty years. I’m afraid something like this will not happen so often. We are a dying species. SR: But you are quite fit and agile. Glover: Thank you, thank you, but let’s not delude ourselves: we are getting old. We will not be able to go on with it forever, it will eventually be over with Deep Purple. Ian Paice had a slight stroke last year, which was a wake-up call for us. He is doing well again, two weeks later we were able to continue our tour. But each one of us has one problem or another. SR: This tour has the moniker “The Long Goodbye Tour”, the new album is called “inFinite”. When is the end? Glover: It’s not that close yet. No one of us wants to stop it now, we like this job far too much. Nevertheless, we want to let it go a little slower, just now we had four months completely free — so much as never before. We will not set a date and will not make a big fuzz about the last concert. But we will not just sneak away. If at any time it’s it’s over, we will say so. Man, I’m over 70. Maybe another year, two years, five years? SR: So many of your songs have gone into history and will exist forever. Will the people in 200 years regard “Smoke on the Water” as they see Beethoven’s Fifth Symphony or Mozart’s “Magic Flute” today? Glover: Yes, it’s very possible, and it would be a pleasure and a great honour. I hope it comes. Hard rock has so much to offer and much more facets than for example heavy metal, where it is only about the fury facet. SR: In the new song “Time for Bedlam” you rage verbally against the “politically crazy”. Are politicians generally distrustful? Glover: No, I do not think so. There are quite decent and honest politicians. But overall, we’re just stepping into a mess that’s bigger than I’d like to bear. Without having to think for long, I could name a lot of politicians who only roar. Where are respect and decency? I am British, I like courtesy. I’ve lived in the US for 30 years, and right now I’m glad I’m in Europe. European values have a very reassuring effect on me. SR: Does Donald Trump frighten you? Glover: Trump does not look a bit empathetic to me and not at all nice. His rhetoric is terrible. I am really not a fan of his politics, but I find his behaviour even more distasteful than his political ideas, which are already bad enough. SR: You have been living in Switzerland for eight years, near Zurich. Glover: Yes, this has nothing to do with the very friendly and reserved nature of the Swiss, but with my wife, who is Swiss. SR: What are you doing on the day of the band’s fiftieth band anniversary in April 2018? Glover: Oh boy, I do not know exactly when that is. We do not celebrate anniversaries. I remember how it was when it was forty. Ian Gillan and I sat in the tour bus, we drove through the night, and Ian said, “Do you actually know what day is it today?” We opened a bottle of red wine and said, “Well then, cheers to us.” That was all. “Where are respect and decency?” That’s something I heard a lot from my parents and people of their generation (who are in their 60ies and 70ies now) when they talked about today’s politics. Maybe Switzerland has moderate politics but everywhere in Europe you will find people who are not far off the man who rules the US now – also in the UK. People are yelling and complaining almost everywhere it seems instead of dealing with actual problems.